Research is building on the many benefits of cover crops, from their ability to help boost yields in subsequent crops to improved soil structure and reduced erosion. Dean Toews’ farm combats erosion by using residue to cover the soil surface in the shoulder seasons. Cover crops can help boost yields and improve soil structure. 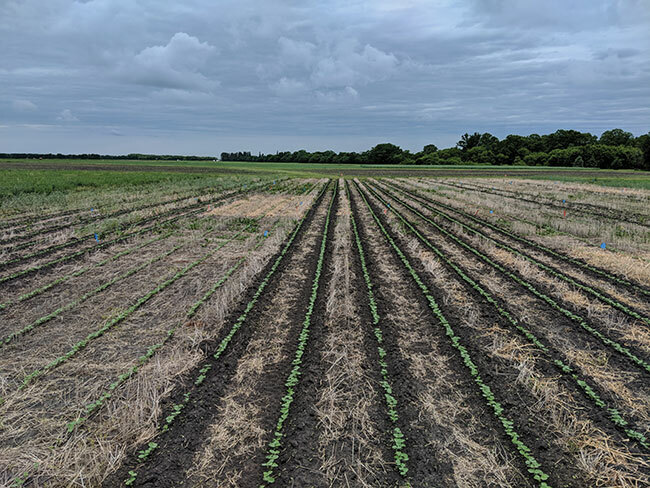 A new area of focus for researchers and producers alike is the use of cover crops in so-called “shoulder seasons” – fall after harvest, and spring before planting – in order to help build resilient, productive soils. “Where we are with climate change, it’s about extremes,” says University of Manitoba cropping systems researcher Yvonne Lawley. “Sometimes both extremes – too wet or too dry – occur in the same growing season, like in Manitoba over the last couple of years where we’ve had both not enough moisture and too much in the same season. “That’s where the theme of soil health comes in. We need soils that are resilient enough to handle both extremes,” she says. The “new paradigm of cover crops,” according to Lawley, is to use cover crops in the shoulder seasons, not just by eliminating fallow but by using the entire growing season, before crops are planted in the spring and after they come off in the fall, to build biomass and provide energy to soil microorganisms and root systems and improve infiltration and aeration in the soil. In 2017, Lawley started a three-year project funded by Manitoba Pulse and Soybean Growers that will look at the use of cover crops following edible beans, which is a low-residue crop. Lawley’s main research goals are to identify which cover crop species can produce the most biomass in late fall as well as optimal planting dates for cover crops following edible beans. According to Lawley, it’s important to take a “humble” approach to this type of research because of its real-world challenges and applications. “It’s important for me to do experiments that compare replicated treatments side-by-side but the work I do is informing those people who are innovating on their farms,” she says. “For me as a researcher working with cover crops, it’s about demonstration of principles that can be adapted and applied to different situations. There is a diversity of needs and questions about how to use cover crops across Western Canada. Where do you start? It’s a conversation between farmers and researchers – that’s how our knowledge of how to use cover crops in Western Canada will move forward,” she says. There are many variables when it comes to working with cover crops. Farmers have to juggle planting and termination dates, budget for extra seed (and sometimes extra equipment), and most importantly, choose the cover crop species that will work best on their operations. Lawley says the latter choice is more difficult in Canada than the U.S., where help for producers to select cover crop species and source seed has become much easier. But farmers’ questions about how best to use cover crops don’t stop there. There are others to consider, such as when and how to seed cover crops during the busy harvest season, how much moisture is needed for seeding cover crops and seed placement. Lawley is collaborating on an experiment with Adam Gurr, a farmer in Brandon, Man., whose company Agritruth Research develops independent agronomic data on cropping systems. Dean Toews’ farm combats erosion by using residue to cover the soil surface in the shoulder seasons. 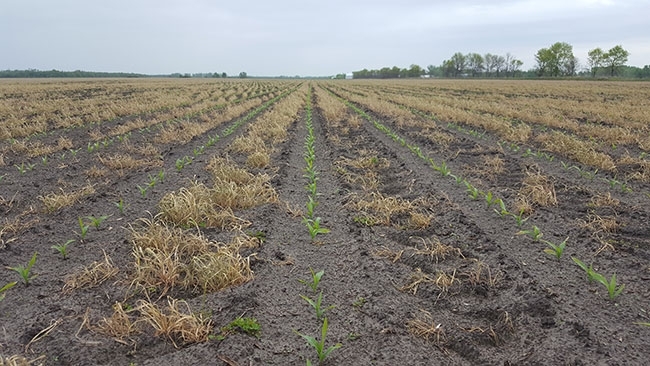 Last fall, Gurr started a long-term cover cropping experiment within an annual cropping system to determine the value of including cover crops in the shoulder seasons. In the Brandon area, Gurr says producers who use cover crops tend to have integrated crop-livestock operations and cover crops are useful for extending the grazing season, but cover crops are not widely used in annual cropping systems. Lawley’s team has funding to do baseline sampling on Gurr’s project for five years, but Lawley plans to continue monitoring the experiment with Gurr over the long term. Dean Toews, who farms near MacGregor, Man. with his father and brothers, has been using a fall rye cover crop since 2005 in order to protect his soil from erosion. 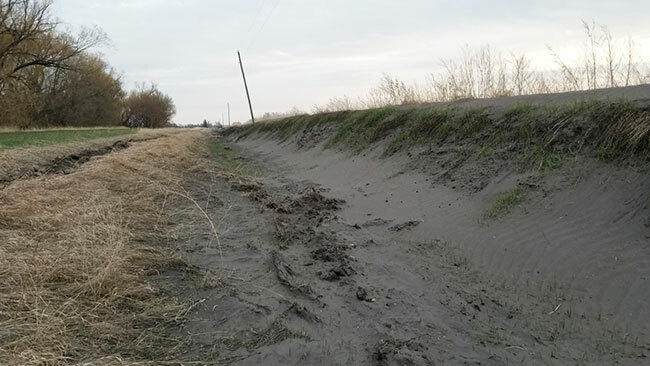 “We have sandy loam soil so the surface can blow for days,” he says, adding some farmers in his region who do not use cover crops end up with sand dunes in their ditches after windstorms. On the Toews’ operation, they grow fall rye following edible beans, and then plant corn in eight-inch strip-tillage strips, terminating the rye after the corn is out of the ground. They put fertilizer right where they will plant their corn in order to prevent the rye from robbing those nutrients from the corn. Before they moved to a strip-tillage system, the Toews would broadcast nutrients and plant corn directly into the rye; the corn would have to compete with established rye and would struggle until the rye was sprayed out. If sprayed too early, the corn would struggle from exposure and wind erosion issues until it was established enough. This means the Toews have erosion protection in two ways: they leave the rye to grow longer, a living cover after the corn is seeded; and the rye biomass from the extra growth provides residue cover after termination, explains Lawley. Toews’ advice to farmers considering using a cover crop is to get it in the ground as soon as possible in the fall. In the spring, he cautions farmers against leaving the cover crop growing too long, particularly if they’re not using strip tillage. On land that is subject to wind erosion, he says the use of cover crops is a good management tool. As far as the value of cover crops is concerned, Toews says it’s hard to calculate, but on his operation shoulder season cover crops work almost like insurance against erosion. “What does it cost other farmers to have the soil blowing into the ditch? What if he starts corn the next year and the sand blows and cuts off the corn stalks or exposes the seed?” he asks. The actual value of cover crops is a practical question that Lawley hopes to answer in another long-term experiment looking at cover crop intensive systems. But for farmers like Toews, it’s already evident that cover crops are an investment in resilient soil.